Six Flags Discovery Kingdom is not a park that usually gets a new, unique coaster every couple years, but they do get them often enough to ensure that the park is not forgotten. Dating back to 2000, Six Flags Discovery Kingdom added Medusa, a B&M floorless coaster. Floorless coasters were only a year old at that time, and it is still the only B&M to include a roll over element. Then, only a year later, the park debuted V2: Vertical Velocity, a very unique impulse coaster from Intamin. Because of a height limitation, the ride had to be modified to be less than 150’ tall. So the park made the incline for the front tower at a 45 degree angle, instead of vertical seen on the standard model Impulse coaster. The back tower remained vertical, but the height was reduced to 150’. 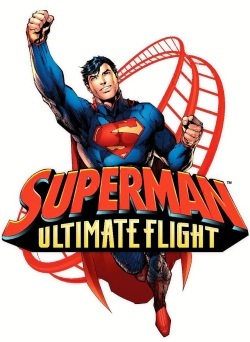 Now for the 2012 season, the park will be adding Superman Ultimate Flight, the most unique coaster that the park has to offer. Built by Premier Rides, this ride imposes many similarities to Maurer Sohne’s X-Car Coaster, but features a couple layout modifications. Instead of a lift to get riders up to the top of the 150’ ride, the ride launches at 62 MPH and twists 180 degrees vertically to reach the apex of the ride. Superman’s only inversion also takes place at the top in the form of any inline twist. The ride then suddenly drops and twists 180 degrees on the way down. During the pull out of the drop, riders pass under a Superman insignia, and then traverses through a non-inverting loop, which drops right back into the station. This is also not the first Superman ride that Six Flags has built however. The superhero is the name for 9 other coasters in the chain, which includes three by the name of Superman Ultimate Flight, built at Six Flags Over Georgia, Six Flags Great Adventure, and Six Flags Great America. These differ from the Discovery Kingdom variant, however. The other Ultimate Flights are B&M Flyers, which are also exactly the same, with some technical modifications with each one. Next is the Morgan hyper Superman el Ultimo Escape at Six Flags Mexico, which is the only one of its name. Then there’s the controversial Superman: Escape from Krypton at Six Flags Magic Mountain, the first coaster to reach the 100 MPH barrier. Some think it’s a coaster, some don’t. Another B&M, Superman Krypton Coaster, the floorless coaster at Six Flags Fiesta Texas, which is built into the side of a quarry. The last two are the Superman Ride of Steels. One of these has had a renovation to Bizarro at Six Flags New England, but the other one retains its name, which is the one at Six Flags America. These Intamin hyper coasters, especially Bizarro, have been given lots of praise over the years because of their great height, speed, and airtime. Don’t know which Superman to choose, or have you been on them all and want something more? Well than this new Ultimate Flight is just for you.